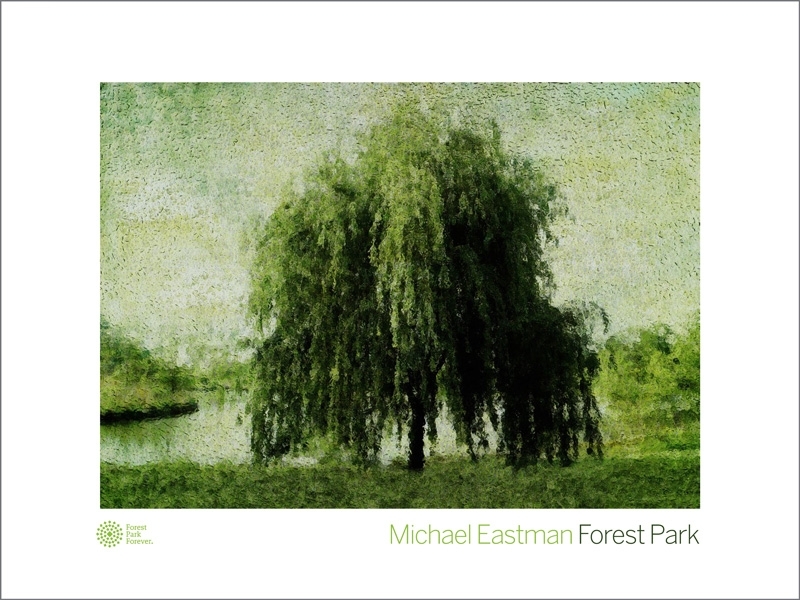 Now available: Limited-edition posters featuring images of Forest Park by photographer Michael Eastman! Exclusively sold to support Forest Park Forever, these special limited-edition posters show off Forest Park in a completely new way. Rendered through a lens of antique art glass, Michael Eastman's images offer both literal and impressionistic glimpses of Forest Park's natural beauty. Members receive a discount! Get in touch to receive a coupon code for 20% off. Hoping to purchase a ready-to-hang poster? While posters are available for $50, we are also offering them in modern white frames for $125 each. Posters are available for pick-up anytime during regular business hours, 8:30 a.m.-5:00 p.m. Monday-Friday. Shipping is not available at this time. The posters have been beautifully designed by St. Louis-based designer Paul Bussmann and printed on 100# Cougar matte paper by longtime local printer Advertisers Printing Co. All frames are made in the USA and sourced via locally owned ArtMart. Framed posters come in a modern white frame handmade in the USA, sourced via locally-owned ArtMart. This item is currently only available for pickup from our office in the Dennis & Judith Jones Visitor and Education Center during normal business hours. Please select the Pick-up Only option at checkout to avoid a shipping charge. As part of the formal launch of Forever: The Campaign for Forest Park's Future, photographer Michael Eastman introduced this new series of Park images in collaboration with Forest Park Forever. St. Louis Magazine published an exclusive portfolio of these images in its November 2015 issue, offering a terrific introductory essay to the series and background about Eastman's longtime interest in Forest Park. Learn more about Eastman and his international work on his website.